Gretag MacBeth X-Rite vipPAQ Inline Densitometer W/3 Heads, Software, Cables. 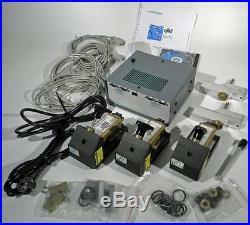 This is a vipPAQ inline densitometer system made by Gretag/MacBeth/X-Rite in excellent used condition. All pieces in the pictures are included. This system can operate on 110 or 220 volts, and comes with both American and European power cords. X-Rite’s vipPAQ is the first high performance multi-channel density measuring system for inline production control and quality assurance of process and spot colors for flexographic and gravure presses. VipPAQ reduces makeready time for print runs and ensures press operators can detect and correct problems early in the print process. Performing quality checks at the control console, vipPAQ monitors density and dot variations due to substrate, viscosity, speed, pressure, temperature, ink impurities, and other variables while printing. Consistent quality, time savings, and less waste. A definite competitive advantage. Modular configurations match any production environment. System includes three measuring heads. Three of the nine channels in each densitometer correspond to the standard printing inks: cyan, magenta and yellow. Nine channels are distributed over the complete visible spectrum, facilitating measurement of spot colors. Optional polarization filter ensures measurement on glossy substrates. It is easy to upgrade existing printing equipment. Suitable for measurements in both “reel-to-reel” and “reel-to-packaging” applications. Supports density values for solid patch control, and dot area values for halftone patch control. Companion software ensures ease-of-use. Touch-screen user interface for clear, easy system configuration and monitoring. Real-time visualization module displays the state of the printing press, provides a trend analysis of the density values for each color, and collects measured values in a database for further analysis – all to meet ISO traceability requirements. Statistical module for analysis and quality reports. Integrated in every stage of workflow. Jobs can be prepared anywhere on the network i. In prepress with the Import Tool application, and can be forwarded directly to the vipPAQ system in the pressroom. References can be measured directly with any X-Rite handheld spectrophotometer and saved in CxF format to communicate colors to other instruments within the workflow. Measurement data of print runs can be viewed and analyzed anywhere on the network i. In the Q-Lab with the Job Viewer application. As always, local pickups are welcome, at no charge! I will only declare items I sell as merchandise at the sale price. Track Page Views With. Auctiva’s FREE Counter. The item “Gretag MacBeth X-Rite vipPAQ Inline Densitometer With3 Heads, Software, Cables” is in sale since Thursday, October 25, 2012. This item is in the category “Business & Industrial\Printing & Graphic Arts\Printing & Graphic Essentials\Densitometers”. The seller is “mehoff58″ and is located in Methuen, Massachusetts. This item can be shipped worldwide. This entry was posted in gretag and tagged cables, densitometer, gretag, heads, inline, macbeth, software, vippaq, with3, x-rite. Bookmark the permalink.